Kevin Liles’ iconic hip hop label 300 Entertainment, home to such multi-platinum acts as Migos and Fetty Wap, has found its newest artist – through social media. 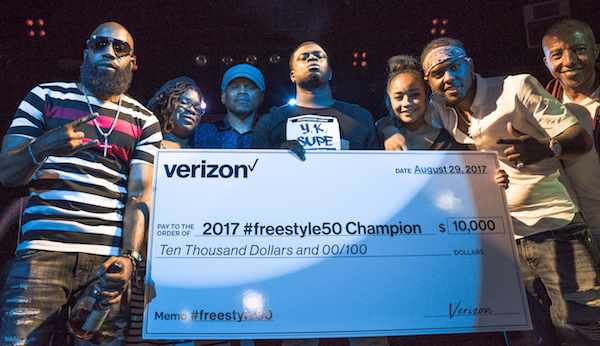 Chicago rapper Y.K Supe, 23, defeated eight of the nation’s top emcees at the #freestyle50 cypher, a freestyle battle tournament, in Hollywood last night to be crowned the winner of Verizon’s #freestyle50 challenge. Y.K Supe will receive a record deal with 300, where his debut single will be produced by London On Da Track (Drake, 50 Cent), as well as $10,000 and an opening slot on the label’s upcoming Artist Development Tour. A hashtag challenge in search of the next voice of hip hop, #freestyle50 is a partnership between Liles and Verizon that celebrates the art of freestyle rap. Launched in July, the competition became a viral phenomenon over the summer; receiving over 9,000 submissions from aspiring emcees from across the country. Hosted by Sway Calloway and Smack White, the #freestyle50 cypher featured eight national finalists – each representing one of the country’s top hip hop cities — battling across various rounds for a shot at the grand prize. Judges for the tournament were comprised of a panel of music industry experts including radio legend Big Boy, Tuma Basa (Spotify’s Global Programming Head of Hip Hop) and Real 92.3’s DJ A-Oh. The exclusive, invite-only event featured special performances by rising stars OMB Peezy and Cyhi the Prynce and special guest appearances by Lyor Cohen and others. The night ended with a surprise performance by rap icon Redman and Tee Grizzley. Music was provided by DJ Amen, DJ Carisma and DJ Dre Sinatra. Now in its second year, the #freestyle50 challenge was inspired by Verizon’s 8GB for $50 prepaid offer available exclusively at Walmart. This year, Samsung joined #freestyle50 as an official sponsor with their J3 smartphones. Additional partners included World Star Hip Hop and Sneakercon. To enter the competition, the public was asked to post a video of themselves freestyling to Tee Grizzley’s ‘No Effort’ to Instagram or Twitter with #freestyle50challenge and @verizon and @300Ent. 300 Entertainment is a boutique music media company that prides itself on being “a record label for the 21st century…capable of launching self-starting artists to the next level without the burdensome bureaucracy—and cost structure—of a major record company.” In the short amount of time the label has found its artists being nominated for Grammys (Fetty Wap and Young Thug), partnering with brands like Coca Cola for advertising campaigns (Conrad Sewell), and had albums go Platinum (Fetty Wap). Founded by industry heavyweights Lyor Cohen and Kevin Liles, the company was also featured in a CNBC short documentary series about innovative leadership and forward thinking companies.